Rumor has it that while Bettman’s number is up…that HOCKEY will be BACK by NOVEMBER!!! ….the NHL has officially tendered a NEW offer to the NHLPA that would give both sides 50/50 split contingent on an 82 game season that WOULD begin November 2 IF the players agree. The jury is still out on whether the PA will agree…but you can almost hear a sigh of relief that an ACTUAL offer was made in today’s meeting. 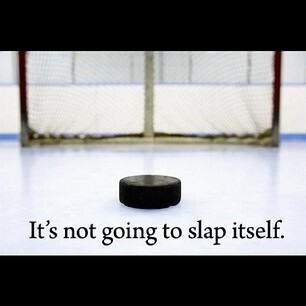 PLEASE NHLPA…let’s really think about this…you could ALL be back playing in 2 weeks & still have an 82 game season!! I have been very vocal about my dislike of this current lockout…..this is the FIRST time that an offer made has REAL potential to be accepted by BOTH sides! THIS deal would last for up to 6 years AND it means a FULL 82 game season NOT a shortened one! Did I [& many others!] not suggest many times previously that the only way to really negotiate this latest CBA would be a 50/50 split? Why…yes, yes I did. This is the first time since these negotiations began back in the summer that I feel there is potential for a new deal to be signed, sealed & delivered VERY soon. I think the players will want to take a closer look at this deal in detail before they consider it as a solution…but it is encouraging to see an actual offer be tabled. Let’s hope they do not take too long in their consideration as if they do sign…they could be back on the ice by NOVEMBER 2!!!! Come on…who doesn’t want hockey back soon? The offer is on the table…your move NHLPA….please do not wait too long to get back to playing the game you all love. The word ‘lockout’ has been forced into the vocabulary and reality of NHL fans three times in the last 18 years….and each time it was GB with the announcement. One would think that if HE cannot get the players to agree to this latest offer or worse takes away the entire year….that his days are not only numbered but finished. There will be a push or counter proposal that comes from the PA soon…but this 50/50 split gives the PA a place to make real progress. I hope the PA realizes that the this latest offer is where things will eventually end up a 50/50 split. This offer also has no immediate rollback. This offer is the first one that is one that seems like real PROGRESS!!! FINALLY! Let’s get this deal & probably counter offer done followed by a new CBA PLEASE!!!!!!!! This is finally some real negotiating!!!!!!!!!! I know that this deal is probably not perfect….but it really is the first time that feels like hockey could be back SOON…as in NOVEMBER. I think it is best for all parties to get this deal done STAT. The PA now holds the cards….the question is how will they play them? Is this 50/50 split really a 50/50 split? If so, then it means that Bettman is finally taking one for the team and moving the league forward…if not…I think it is good-bye Gary! As always, until next time[when hopefully I can be sharing the news of the 2012-2013 season being back on and no more lockout!] nuck said. #SC87 Crosby’s back!! !…but where will he lace ’em up?? SIDNEY CROSBY is back!! The NHL received some amazing news about one of it’s most notable faces while the fate of the hockey season is still in limbo. A lockout is looming ever closer. Sidney Crosby is back. He’s healthy and throughout the summer experienced no concussion setbacks. Crosby is healthy for the first time in more than a year and he might not get the chance to play. Questions have surrounded him since the hit that knocked him out of the game for 10 months and then again for a time after his comeback whether he could ever reach the high bar he set before his concussion. Answer: YES he could and he did just that in his return game last year….and now that he is 100% healthy there is no doubt of the fear he could instill in the leagues best goalies once he unleashes that patented wrist shot! One of the BEST players in the game since Gretzky…and he has a chance to put on a show once more but the league might not have a season? Are you kidding me? Can you blame Crosby and other players for making a plan B to play in Europe or Russia? I think there is something wrong with that picture. I think all PENS fans want their dynamic duo of Sid & Malkin back in the igloo creating ridiculous plays. I know I would rather have Crosby and company playing in the league we all love to watch then somewhere abroad! [who doesn’t want a Crosby or Malkin on their team?…the league would not be the same without them]. The league needs to remedy this situation before it loses its top tier players to the other leagues for longer than the [potential full-season] lockout. None of the players want to lose the whole season…so is there a solution[besides Bettman stepping down]? There is something not quite right when one of the faces of the NHL is not able to play due to politics among the league and its players. Bettman, are we really going to let politics and numbers get in the way of what could be an amazing NHL season and let the KHL and European leagues showcase the NHL’s best talents? Wow. New low for the NHL if this becomes a reality with a lockout. The worst part about this ordeal is that while Bettman has been spewing his line of ‘the NHL has the best fans’…he does not actually care about the fans at all. The only thing that seems to concern is the money involved. In short, Sidney Crosby is back 100% healthy but what exactly is he coming back to?…a full or shortened season?..or NO season being pushed to play abroad? I have got to say that I do not like the prospect of Crosby or any other essential NHL player taking their careers abroad..but what other choice will they have if the NHL locks them out. Here’s a glance at what could be next season if the NHL and NHLPA can agree on a new CBA: Sidney Crosby back 100% with NO setbacks since the season ended and raring to get back to the game he plays at a higher level than most; Shane Doan finally signing on the dotted line; the Staal brothers united for the first time in their careers with so much upside; the combination of Parise and Suter in Minnesota; the trade deadline as teams seek that one missing piece for their playoff push; teams fighting for that last playoff berth or pushing for a division title; a hard fought playoff battle come April-mid June ending with of course ONE Stanley Cup champion. These are things that will happen should a new CBA be reached. Without a new CBA in place none of these things [save Doan finally signing a contract] will happen. We will miss all of these moments and any others that could be. A lockout takes away all the possibilities of what next season could be. The NHL and NHLPA met this morning and exchanged proposals. Players that were there to represent the union included: Schneider, Malhotra, Darche, Campoli and Parros to name a few. At least both sides were finally in debating mode after days of no real conversations. Another round of meetings is set for tomorrow in one last major effort to forge a new CBA in time before the existing deal expires. Both sides have stated that they both have made adjustments in their view points…but there is still work to be done before they are both on the same page. 3 more days before anything is official. 3 days before we find out if these talks are in any way meaningful to the season that could be. I am getting tired of seeing the word ‘lockout’ but until a new CBA is in place…it will be unfortunately in my vocabulary…not welcome mind you…but in it none the less. Today’s ambition is to look at some [not all] major questions surrounding the stalled CBA talks and maybe just maybe rant a little more [if possible] in regards to the ever increasingly real possibility of a 2nd lockout in less than 10 years. Question: WHY are the OWNERS, and BETTMAN dragging out these negotiations?! Answer: They want MORE money and want to the players to make LESS money!….interesting concept as it does not match their current actions…. [see below questions]. Question: IF playing the game is not about the money…WHY do the players keep signing BIG money deals? Question: IF the owners want the new CBA to limit the length of years a player can sign for at 5 years…WHY do OWNERS keep signing big name players to insanely LONG-TERM deals? Question: WHY is it that both sides have very different views of the new potential CBA agreement? Question: WHY….WHY tease the fans with the release of the broadcast schedule? Answer: I will tell you this, it certainly is a cruel way to raise the fans hopes of their being a season only to have taken away if Bettman throws the gavel down with his desired ruling of a lockout. Welcome to September! Surprise, surprise. CBA meetings ended Friday with little progress once more as both sides still struggle to see eye to eye. The question is, when will the next CBA session take place? The next round of meetings has yet to be scheduled although rumors are swirling that this is just the beginning and more will be known closer to the 15th.Both sides have yet to see eye to eye on any proposal made. Talks seemed to have stalled and neither side is yet willing to give what it will take to reach a new agreement especially as Bettman wants the players to take a pay cut. He wants to them to see less and less profit each year….and is more than willing to enforce a lockout to achieve that aim. Not acceptable. Time is quickly winding down. Yesterday marked exactly two weeks until Bettman makes it official one way or the other…but each day that goes by with no answers makes it seem inevitable that he will lockout the players. The gavel will come down and it seems that Bettman is not in the business of gaining fans but rather gaining more who dislike him. Enough with dragging it out until the 15th…just come to an agreement already! Like any hockey fan, I would just like to know when or if the season will start! The decision feels like its already been made with little or no progress after each meeting….and it does not seem like one that will please the fans unless some drastic progress gets made in the next 13 days. I would love to hear that YES the season is starting on time…but we could hear NO it will be delayed or NOT at all. I would certainly love to write about more than the *potential [but very likely] lockout in the days that follow…but until the bricks fall into place that is all there is to report.